Mutations in the LMNA gene resulting in the substitution of the highly conserved arginine 482 residue in the globular C-terminal domain of lamin A/C are associated with the Dunnigan-type familial partial lipodystrophy (FPLD2) often accompanied by impairments in the muscle tissue development. The mechanisms underlying these impairments remain unknown. The purpose of our work was to investigate the effects of the LMNA gene mutation R482L on the muscle differentiation and intramuscular fat accumulation using C2C12 mouse myoblasts transduced with the lentiviral constructs carrying the wild-type human LMNA gene (LMNA-WT) or the LMNA-R482L mutant gene. After stimulation of myogenesis and adipogenesis in the transduced cell, expression of muscle and adipose tissue differentiation markers, morphology of differentiated myotubes, and formation of intramuscular lipid droplets were analyzed. C2C12 cells carrying the LMNA-R482L construct exhibited upregulated desmin expression at all stages of muscle differentiation and transformed into hypertrophied myotubules (in comparison with C2C12 myoblasts transduced with LMNA-WT). Reduced expression levels of the myogenic transcription factor Myf6 in the cells with the LMNA-R482L mutant indicated delayed maturation of muscle fibers. These cells more actively accumulated fat in response to the stimulation of adipose differentiation than myoblasts modified with the wild-type LMNA; they also expressed the markers of lipid droplets, such as FABP4 (fatty acid-binding protein 4), ATGL (adipose triglyceride lipase), and PLIN2 (perilipin 2). Therefore, the R482L mutation of the LMNA gene affects the dynamics of C2C12 myoblast differentiation into myotubules and stimulates formation of fat deposits in the myoblasts and myotubules in a tissue-specific manner. Russian Text © N. V. Khromova, K. I. Perepelina, O. A. Ivanova, A. B. Malashicheva, A. 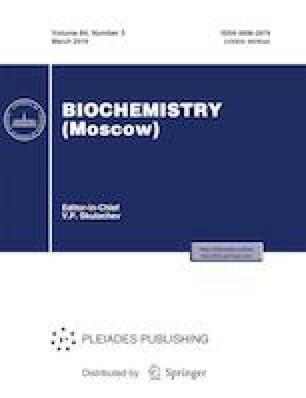 A. Kostareva, R. I. Dmitrieva, 2019, published in Biokhimiya, 2019, Vol. 84, No. 3, pp. 354–364.